Deposit #1 - 100% match with a max value of $1000. Deposit #2 - 100% match with a max value of $500. If you’re reading this, you’ve obviously been persuaded by the generous welcome promotion and bonuses on board at Joe Fortune Casino. Just by heading to the Joe Fortune Casino login page, you’ll see that this casino means business. The site has a plain and clean look with a bunch of its most popular promotions and games listed on the front page. Below that, there’s an FAQ answering the most common questions that any players might have, with a help box alongside it. It’s all about ease here at Joe Fortune Casino and you can see that from the very beginning. The casino has partnered with a few software providers so you have many different games to play. That means that whenever you head online to have some fun at this online casino, you'll get to experience a bunch of different games all while playing under the same banner, which makes it very easy. 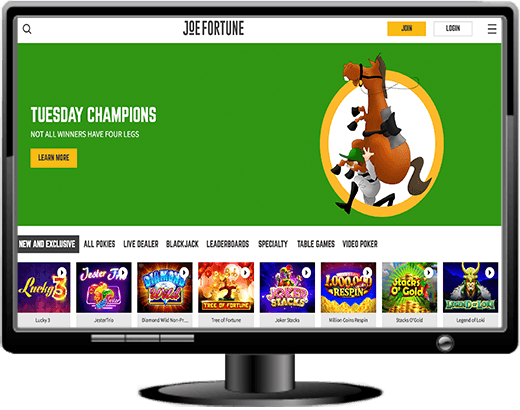 Joe Fortune Casino has partnered with software giants Rival, RTG and iSoftBet. In addition to those two, there is also a partnership with Makitone Gaming and Visionary iGaming too, which allows for some of the exclusive games that the casino offers. The games are provided through a web-based instant play platform that works across desktop and mobile and allows players to get a taste of any kind of online games that they desire. Joe Fortune offers a very wide range of pokies, all listed in alphabetical order on the site. They also get a bunch of new games in all the time, so you can sort by new and exclusive too. Aside from the regular pokies, you'll also get progressive jackpots here, some blackjack and roulette variants and a bunch of specialty games. The Table Games menu will allow you to experience the difference between American and European Roulette, the different types of Poker available, Perfect Pairs, Pai Gow, Bacarat, Roll the Dice and Three Card Rummy. Joe Fortune Casino also have a fair amount of video poker games available for people to play and live dealer games, where you can try baccarat, blackjack and roulette. As can be expected from a casino such as this, the site is fully mobile responsive and players with all types of smartphones and tablets will get to experience all the glory in this site. Many of the pokies and table games that the casino offers have been adapted and changed so that players on mobile can give it a go. It's definitely no secret that mobile gaming is the way to go and that's why there is such a wide variety and selection available to people who want to play at Joe Fortune. The games have been slightly adapted and somewhat changed in order to cater to people using different kinds of devices. Our review team has been able to test a number of them and can confirm that things run well. The mobile casino supports the majority of phone platforms available. Also, thanks to the fully mobile responsive site, you can enjoy all the same promotions and such as if playing on the deskptop casino. Whether you're running an iPhone 3S or a phone from the last few years, dating back to Android version 3.5, you'll be able to play the games that Joe Fortune has to offer. Some of the mobile version may be a little different in that a few visual bells and whistles go missing, but this is all to do with your player experience. They want you to have the best time no matter the device you're on. While there aren't as many progressive jackpots to choose from at Joe Fortune, you'll still get that taste of big money when you play. You won't have access to big millionaire-makers like Mega Moolah or Aztec's Millions but Rival offers its own brand of big money progressives. You'll be able to play Major Moolah, Money Magic, One Million Reels and Strike Gold, all of which offer progressive jackpots and tend to payout fairly regularly. The jackpots may not be as big as some other industry leading progressives but can still make a massive difference to your life when you win. At Joe Fortune Casino, you can get a big welcome bonus where you'll be able to double your money up to $1,000 on your first deposit. If you deposit using Bitcoin or Bitcoinc Cash, you'll get double your money up to $1,500! Once your first deposit is done, you can get another matched $500 on your second deposit, and $750 if using crypto. All the bonuses have a 30x playthrough too! What a bargain! Joe Fortune will also match your first deposit each day up to $50, so you can be sure to have a great time whenever you play if you're a new or returning customer. Joe Fortune Casino also offers an exclusive VIP program through Joe’s Rewards where your loyalty gets rewarded. Mates Rates is also a thing here because you'll get $50 for every friend that joins up and deposits. They'll also get the $50 including the welcome bonus of up to $1,500! Joe also offers a chance to win spot cash prizes as the day goes on as you can earn points in different scenarios and depending on the time of day, could be eligible to win! Joe's Fortune has a great little FAQ where you'll find the answers to some of the most basic questions. If you have a question about bonus eligibility or a question about which games you can play with your bonus, you'll find the answers here. If there's anything else you need to answer to, you can contact the casino by entering your email and selecting the appropriate inquiry and popping in a short message. Through this option you can also choose to chat now and you can also choose to phone in and speak to someone in person. The banking options at Joe Fortune Casino are a little limited but they cater to most people because it seems that these days, everyone owns either a debit or a credit card. You can use both VISA and Mastercard to deposit at Joe Fortune, but you'll also be able to use cryptocurrency in Bitcoin and Bitcoin Cash. Make sure you check the appropriate welcome bonus for added crypto rewards! For withdrawals you're a little out of luck because you can only really get the money through bank transfer into your bank account, and through bitcoin. If you're not one who has dabble in, or is yet to dabble in cryptocurrency, you may find this a bit daunting so bank transfer is your only option. With regards to withdrawal speed there isn't much that can be done. Bank transfer is by far the most popular withdrawal option at Joe Fortune and as a result of that, it's processed quickly, but there's always a delay on some end. Most banks take between 3 and 7 business days to process a payment into your account, so you may find it takes some time. The Bitcoin transfers do happen a lot faster, but again, can be daunting if you haven't actually used cryptocurrency before. These transfers will usually happen instantly but can take anywhere between 1 and 6 hours depending on how quickly it's processed. If you're looking for online casino play in Australia then it should come as no surprise that Joe Fortune Casino is one of the top ones. They offer a wide range of specialty games, pokies and table games that can make any gambler weak at the knees. The site functions really well both on desktop and on mobile and the customer service is friendly and always available. The only down side to playing at Joe Fortune is that you have a limited choice of banking options. If you're not too worried about putting your debit or credit card details in, then that's fine, but you won't be able to use any ewallets here. The cryptocurrency addition is a great one, but it's going to take some time before it becomes widely adopted as a payment method for most consumers.